Songbirds feeding near the contaminated South River are showing high levels of mercury, even though they aren’t eating food from the river itself, according to a paper published by William and Mary researchers in the journal Science. Lead author Dan Cristol said his paper has wide-ranging international environmental implications. Mercury is one of the world’s most troublesome pollutants, especially in water. The South River, a major tributary of Virginia’s Shenandoah River, has been under a fish consumption advisory for years, as are some 3,000 other bodies of water in the U.S. The paper shows high levels of mercury in birds feeding near, but not from, the South River. Cristol and his colleagues also identify the source of the pollutant—mercury-laden spiders eaten by the birds. The Science paper is one of the first, if not the first, to offer scientific documentation of the infiltration of mercury from a contaminated body of water into a purely terrestrial ecosystem. Cristol and his co-authors, all students at the College of William and Mary, have been researching mercury impacts on birds along the South River for the past three years. The waters of the river were polluted with industrial mercury sulfate from around 1930 to 1950. He explained that mercury enters the food chain through a process called methylation, in which bacteria convert the mercury to a more potent form. The methylated mercury is passed up the food chain, becoming more concentrated in the bodies of larger animals through a phenomenon known as biomagnification. Biomagnification of mercury in fish and fish-eating birds and other animals has been studied extensively, while little attention has been paid to the effects on animals near the river, but with no direct connection to the aquatic ecosystem. The researchers studied the food actually brought by songbird parents to their nestlings. 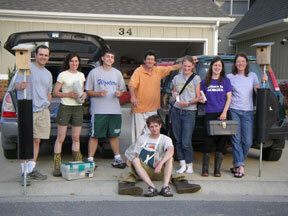 Cristol’s group is a part of the Institute for Integrated Bird Behavior Studies at William and Mary. Co-authors on the paper are master’s degree students Ariel E. White ’07, Rebecka L. Brasso ’07, Scott L. Friedman ’07 and Anne M. Condon ’08, along with undergraduates Rachel E. Fovargue ’09, Kelly K. Hallinger ’09 and Adrian P. Monroe ’08. Cristol and his group will continue their studies of the effect of mercury in the songbirds of the Shenandoah Valley, including an examination of the effects of the contaminant on the reproduction and lifespan of the birds. Their paper appears in the April 18 issue of the journal.